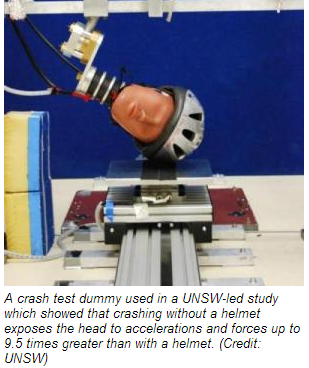 The test replicated the oblique impact on the head and on the neck after falling from a bike at different speeds and heights and compared the results of the impact on a helmeted and an unhelmeted head. The results showed that a good helmet with tightly adjusted restraints can protect motorcyclists head from serious injuries even during the most severe impacts. “When you look at injury risk, an unprotected head is likely to suffer concussion even dropping only half a metre while you are stationary, as the height of the drop and the horizontal speed increase, so does the risk of skull and brain injury” says Dr Andrew S. McIntosh, the study main author and an adjunct Associate Professor at UNSW’s Transport and Road Safety Research Group and the Monash Injury Research Institute at Monash University.